Adds a glow from the Foreground clip onto the Background clip, and vice versa, then composites the Foreground over the Background. This can be used to make a composite look more natural with light flashing between the layers as if exposed on film together. Mode: Popup menu, Default: Original . Fg Flash Amp: Default: 0.8, Range: 0 or greater. The amount of flashing from the Front onto the Back. Bg Flash Amp: Default: 0.8, Range: 0 or greater. Flash Width: Default: 0.1, Range: 0 or greater. The width of the flashing. This parameter can be adjusted using the Flash Width Widget. Output: Popup menu, Default: Comp . Selects between different output options. Foreground: outputs only the Front clip with flashing from the Back. Background: outputs only the Back clip with flashing from the Front. Comp: flashes both, composites the Front over the Back, and outputs the result. Subpixel Widths: Check-box, Default: off. Enables flashing by subpixel amounts. 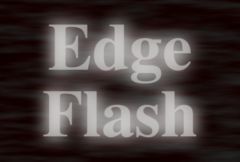 Use this for smoother animation of the flash width. Front Lights: Default: 1, Range: any. Front Darks: Default: 0, Range: any. Adds this gray value to the darker regions of the Front input. This can be negative to increase contrast. Front Sat: Default: 1, Range: 0 or greater. Scales the color saturation of the Front input. Increase for more intense colors. Set to 0 for monochrome. Back Lights: Default: 1, Range: any. Back Darks: Default: 0, Range: any. Adds this gray value to the darker regions of the Back input. This can be negative to increase contrast. Back Sat: Default: 1, Range: 0 or greater. Scales the color saturation of the Back input. Increase for more intense colors. Set to 0 for monochrome.